Could 2016 end Philadelphia's streak of snowless Christmases? 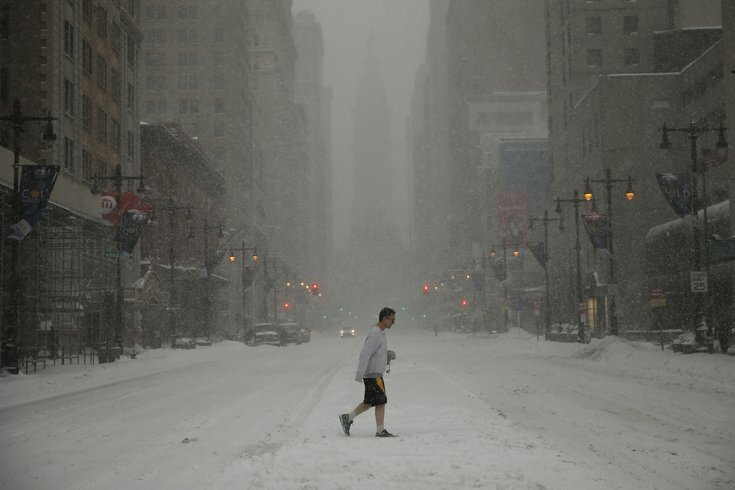 A man crosses Broad Street through a snowstorm, Saturday, Jan. 23, 2016, in Philadelphia. Hoping for a white Christmas? Keep dreaming. The National Weather Service snowfall and snow depth log shows that it hasn't significantly snowed in Philadelphia on Christmas Day since 2002, and this year is expected to be no different. Forecasters are predicting a pretty pleasant day Sunday, with the mercury creeping up near 48 with a low around 34, according to the NWS. The AccuWeather extended forecast shows clear skies with wind gusts reaching just 8 mph with a zero percent chance of precipitation. Christmas Eve will be much soggier, with rain off and on throughout the day until about 3 p.m. A half an inch of rain is possible. The high is expected to be around 47, with a low near 33. But it's not expected to be anything like last year, when the high reached 68 degrees – warm enough to throw a couple of steaks on the grill in lieu of a Christmas ham. You couldn't have gotten much further from the Winter Wonderland that most hope for. The last time the Philly area saw snow on Christmas Day was back in 2002 when about an inch coated the ground. And the last significant amount before that? About four inches fell in 1969. But who needs a white Christmas anyway?